The iPad is certainly a much better reading/watching device than an authoring one, at least in these early days. Still, its impressive portability makes me want to see how suitable it is for blogging. After all, the best blogging client is the one you have with you, and all that. Also, I like to play with it. Magic space tablet from the future, take me away! I wrote my last post in the Blogger editor (copying in bits that were written in iTunes), which was workable, but hardly ideal. Mobile Safari does not support rich text editing in HTML with contenteditable, so I had to settle for Edit HTML mode over Compose. I'm happy to say that the toolbar works when you select text, so I didn't have to type in the bold or link tags myself. Scrolling, however, was pretty painful: though iPad often allows scrolling of overflow: auto elements using a two-finger scroll, this does not appear to work on a <textarea>. My only recourse was to drag-and-hold the insertion point at the top or the bottom and wait for the painfully slow scrolling to show me what I wanted. The new editor's Edit HTML also lacks photo insertion, though with the lack of upload support in the browser I couldn't have done more than pick from Picasa Web Albums. In all, the post editor is there, but you'd likely be happier e-mailing a post using Mail-to-Blogger unless you were really committed to a bit of formatting, linking, or adding an After the Jump marker. I tried to make a post via Pages, since it has full image positioning and text formatting controls, which would make it an ideal editor, but its exporting is limited to its own format, PDF, or Word. Sadly there's no way to get an HTML-formatted e-mail out of it. So far, it's ok. Certainly better than using Edit HTML, since the native text box is more pleasant than the one in Safari. 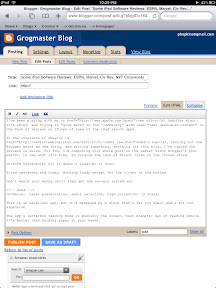 Nevertheless, other parts of the app are rough: there's no text formatting at all (and writing HTML tags on this keyboard is far too cumbersome); draft posts are not saved to the server, and don't immediately appear in the post list after saving; posting images to Picasa Web Albums is available, but the app doesn't re-use Blogger credentials, which would typically be the same; HTML entities need double-escaping to be stable; my post got scheduled rather than published when it was made. 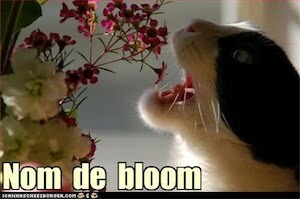 Still, any sort of image upload (which I hope you're seeing on this post right now) is worth having. Given BlogPress's near-impulse price point, I will hesitantly recommend it as the best available option, but I will likely pester Daniel Jalkut to make an iPad version of MarsEdit in the meantime. Warning: BlogPress will link photos to their Picasa Web Albums pages, even if those photos are uploaded to unlisted albums. Unless you delete the links, your readers will be able to click through and see the entire album. This may not be what you want. 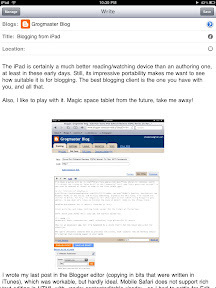 Are you blogging on iPad? What software have you tried? Developers: I'd be happy to try anything you have out or give a bit of feedback. Update: Fixed entity encoding and spacing around the images, added "scheduled" note, and added labels (using Edit HTML).